12 plastic bag manufacturers in Bangladesh may soon have a new job at hand. Beside manufacturing the widely popular packaging material, they might also have to collect the waste generated from their products because thoughtless usage and heedless disposal of waste have become a major environmental and health hazard. Globally, plastic bags have been in use for nearly a century. But Bangladeshis have been using them widely only since the 1980s. And such has been the level of irresponsible usage and the adverse impact on the environment from the very beginning that, in less than 15 years, a ban on their use had to be imposed. Interestingly, Bangladesh was the first country in the world to ban plastic bags. But they are still widely used – ignoring the ban. Then they are thrown anywhere and everywhere, especially the cheap, thin bags in which almost every item of vegetables, groceries and other household goods are packed. The thicker ones are more durable, so they are reused more often. But they are also more expensive, so most shopkeepers do not use them. There is no reason to think that Bangladeshis are anywhere close to being the biggest consumers of plastic packaging – the per capita consumption of about eight kilograms per year is no match for Singapore’s 135 kg, USA’s 100 kg or Britain’s 70 kg. 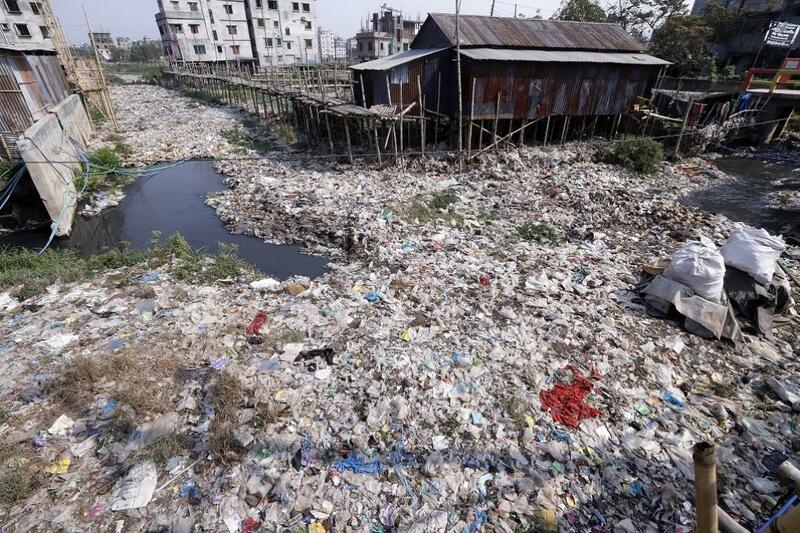 But when it comes to littering, especially of plastic bags, Bangladeshis would probably outclass everybody else. 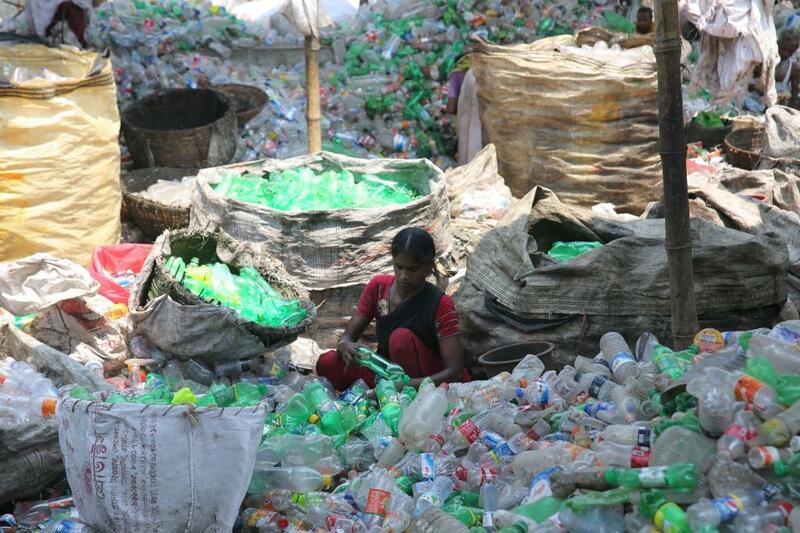 The plastic recycling industry in Bangladesh comprises only 200 companies who claim to be recovering about 70% of the plastic waste that is being generated in the country. Unfortunately the remaining 30% still amounts to about 17,000 tonnes annually. A bulk of this waste gets trapped in the sewers of the major cities. Trapped in the pipes and drains, especially of densely populated capital Dhaka and the second largest city Chittagong, this plastic waste has caused the sewerage systems to break down repeatedly. UN Habitat says Dhaka is the world’s most crowded city, with 44,500 people living in each square kilometre. More are added every day, especially from coastal areas, as people are forced out of their homes due to sea level rise and increased soil salinity, consequences of climate change. For several decades, waterlogging during the monsoon season has been a common problem in these cities. Streets get waterlogged after just a few minutes of rainfall as the water cannot pass through pipes clogged almost completely, mainly by plastic bags. The fact that many of the canals and streams that once formed natural drainage channels in Dhaka have been filled up, encroached upon or silted does not help matters. Dhaka used to have 65 canals that drained rainwater to surrounding rivers including the Buriganga, Turag and Shitalakhya. But the number has come down to only 43. And the existing canals are falling prey to illegal encroachment too, officials said. “In the last one decade, the city canals have either been grabbed or turned into a dumping zone and clogged sewerage system and created waterlogging,” said Khondaker M Ansar Hossain, a technical expert on Detailed Area Plan (DAP) for Dhaka. In many neighbourhoods, water floods streets for days at a stretch, becoming favourite breeding grounds for mosquitoes. The consequences – dengue, chikungunya and malaria. It does not have to be this way. The Dhaka North City Corporation and the NGO Social and Economic Enhancement Programme ran a “Towards Resilient Dhaka Project” in some parts of Kurmitola slum last year to make it a waste free zone. Kamaluddin, a Kurmitola resident, said they are now all aware of the issue and do not dump any plastic bottle or polythene bag in the drains. Since last year, there has been no waterlogging in the area. According to the Bangladesh Plastic Goods Manufacturers and Exporters Association (BPGMEA), the industry is worth $3 billion, with domestic consumption valued at about USD 2.2 billion. “Nowadays, everything comes in a mini pack. Alarmingly, very few of these mini packs are recycled. They are either thrown in the landfill or get trapped in the sewers. Eventually, they end up contaminating the water system,” said Bangladeshi environmental activist Shahriar Hossain. Polymers are mostly non-biodegradable. They form a layer on the surface of soil and water. Since polymers are mostly impermeable, no air passes through that layer. All animals and plants living below that layer are starved of oxygen. Despite desperate efforts, the authorities have failed to clean the sewers, and more importantly, to make people responsible about using and disposing plastic bags. From time to time, there have been government efforts to popularise organic packaging materials such as jute and cotton, but in vain. The fact that Dhaka has seven government departments and two mayors tasked with maintaining and improving the city’s infrastructure does not help – it only means nobody takes responsibility. Residents wryly recall television images of South Dhaka Mayor Sayeed Khokon standing in knee deep water last monsoon and blaming the Water Supply and Sewage Authority for the mess. Now the government wants plastics manufacturers to be in charge of recycling, by taking back bags via shops. Many of the manufacturers have been making high profits due to the demand for convenient industrial and home packaging materials. “Like in the developed countries, we are launching a service through which consumers will be able to exchange their used plastic products with the manufacturers and get a discount for buying a new product,” said Quazi Sarwar Imtiaz Hashmi, additional director general of Bangladesh government’s Department of Environment. The department would set up a separate monitoring cell to ensure the success of this scheme, he added. Last year, Bangladeshi entrepreneur Khadem Mahmud Yusuf started the first PET bottle recycling factory in Bangladesh. Polyethylene terephthalate, usually abbreviated as PET, is the most common material used in fibres for clothing, containers for liquids and foods, manufacturing, and so on. Bangladesh spends about USD 225 million a year on import of more than 140,000 tonnes of raw materials to produce PET products and synthetic yarn for its readymade garments (RMG) industry – the country’s biggest foreign currency earning sector. On an average, four billion PET bottles are manufactured every year in Bangladesh, especially for marketing carbonated beverages, and most of them are discarded after being used once. The hope now is that they will be recycled, along with plastic bags. The extent to which this initiative will work remains to be seen.